The elaborate buildings of the Venetian Resort Hotel Casino in Las Vegas, Nevada, USA. The exquisite Venetian Hotel and Casino in Las Vegas, Nevada, USA is as real and breathtaking as actually going on vacation to Venice, Italy. The Venetian offers romantic gondola rides down the Grand Canal taking you under bridges and balconies between the Italian shops and cafes while a gondolier sings you beautiful Italian songs. After a fast paced day around the city of Las Vegas there is nothing more enjoyable than a gondola ride at the Venetian Hotel to unwind and chill out. 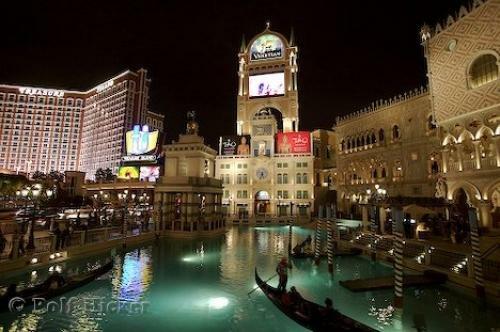 Photo of the Grand Canal at the Venetian Hotel in Las Vegas, Nevada, USA.